The history of the Ford Mustang is one of legends among legends within legends. Part of that expansive pony-car legacy is the Ford Mustang Cobra Jet, a quarter-mile-eating monster that first terrorized competitors on the drag strip 50 years ago. Given the impending return of the Mustang Bullitt and eventual return of the Mustang Shelby GT500, it’s fair to say that Ford’s feeling nostalgic for the olden days of late. This trend continues with the announcement of the 2018 Ford Mustang Cobra Jet. 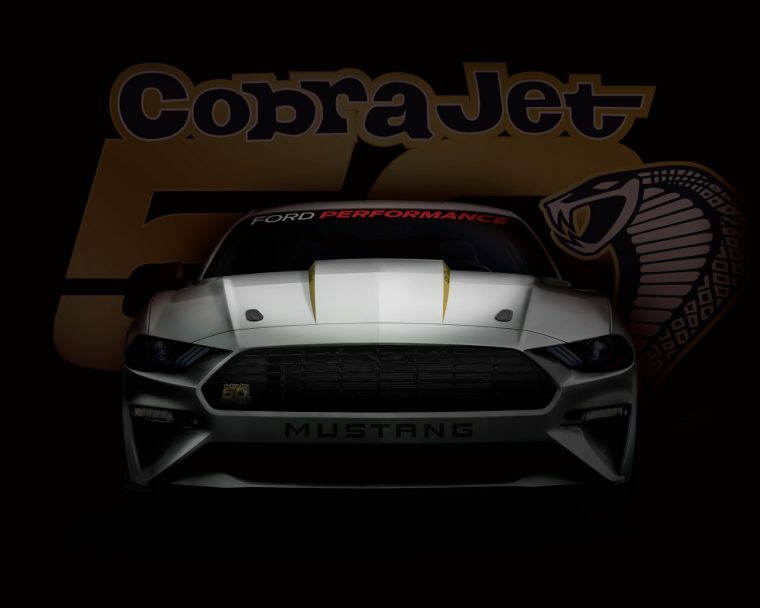 The new Mustang Cobra Jet is being projected to be the most powerful and quickest ever built. Initial estimates have the Ford Performance-built drag race car making a quarter-mile in around 8.5 seconds and hitting a 150-mph top speed. Ford will build just 68 non-VIN production examples of the Mustang Cobra Jet. Each will include a supercharged 5.2-liter Coyote V8, four-link rear suspension, 9-inch solid rear axle from Strange Engineering, NHRA-certified roll cage, Racetech FIA seats, and specially designed and 50th-anniversary-badged Weld Racing Wheels. The 2018 Ford Mustang Cobra Jet will be offered in either Race Red or Oxford White, and each will be offered with a special graphics package that celebrates the 50th anniversary of the namebadge with commemorative graphics and badging. Final ordering information and product specs are set to be revealed later this summer.